The story of my dining room is really a saga. A great love story, a tragedy, a failure, a triumph. It is an evolution. 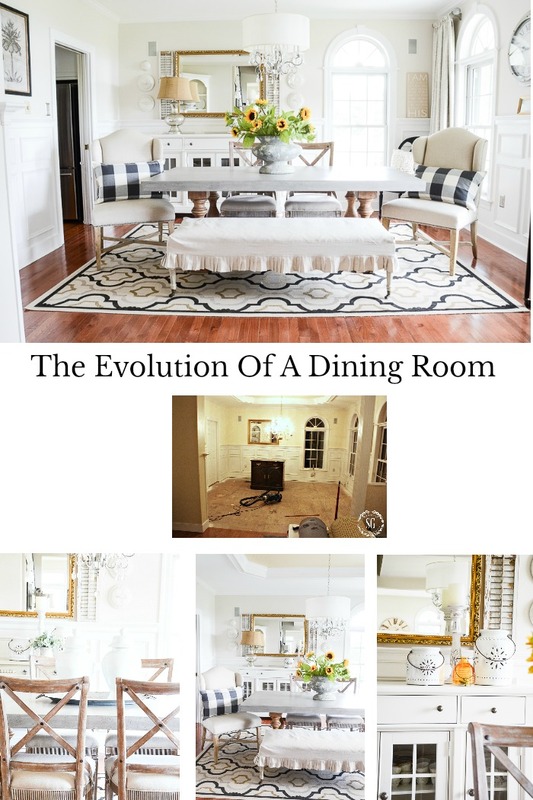 Actually, the evolution of a dining room, part 2! Yes! I just can’t seem to leave this room alone! And for good reason! This room, more than any other room in my home, feels like me! If I were a room I’d be my dining room. So after a quick review and we’ll get on with the continuing evolution! It’s been a long road of great fails and mistakes and mountain high successes and big wins. Decorating is never, I repeat never, a straight line from start to the finish line (if there is such a thing as a finish line in decor). Let me take you on the road less traveled as I share my gut to glory story of the dining room at StoneGable. My decorating skills were not the only thing to change. So did my picture taking skills! 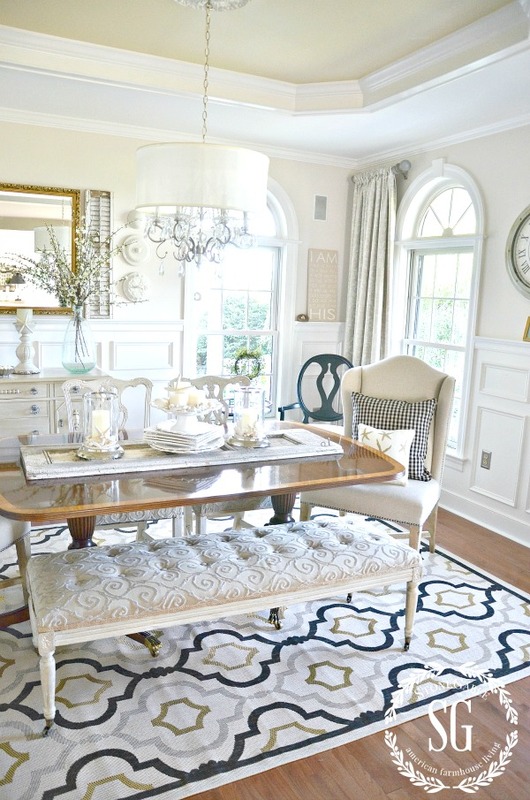 You can read about THE EVOLUTION OF A DINING ROOM, part 1 HERE. We start our journey in the dining room in early 2010. 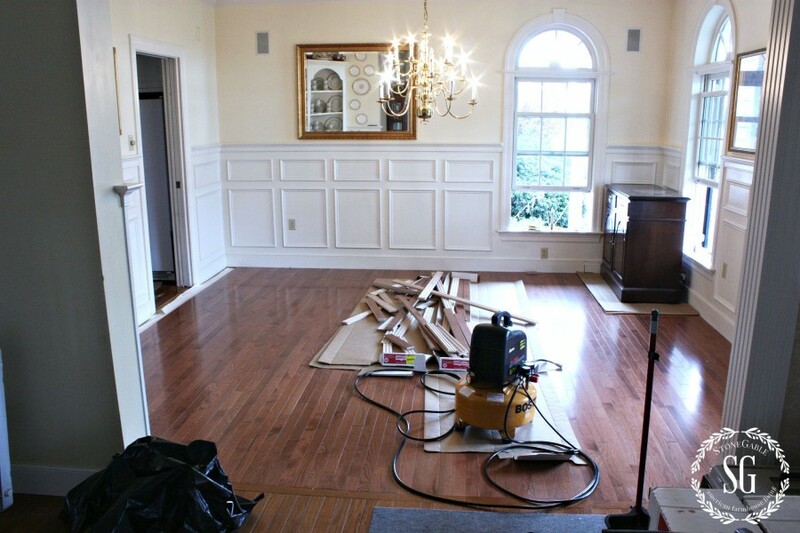 We gutted the wall to wall carpet and replaced it with hardwoods to match the foyer. We also got rid of the gorgeous (and it really was) but dated brass chandy and replaced it with a much cheaper albeit more in style one from Overstocks. We have the same one today! The height-of-style-90’s butter yellow walls were painted Benjamin Moore Sonnet after much angst and deliberation. I adore this color and my entire downstairs is now painted a soft bone-white. And speaking of bones, the dining room has great bones! I opted to keep the tray ceiling. I think it suites the room. Just a little nod to the style of the time in which StoneGable was built. An oriental rug was originally under the table and then vert shortly replaced with this indoor/outdoor rug from Ballard Design. The oriental rug a complete design fail but the indoor/outdoor rug a surperlative win! I’ve had the Ballard rug for over 6 years and LOVE it to this day. Let’s stop the progression and go back before the rugs I am a bit out of order. Oh, dear! 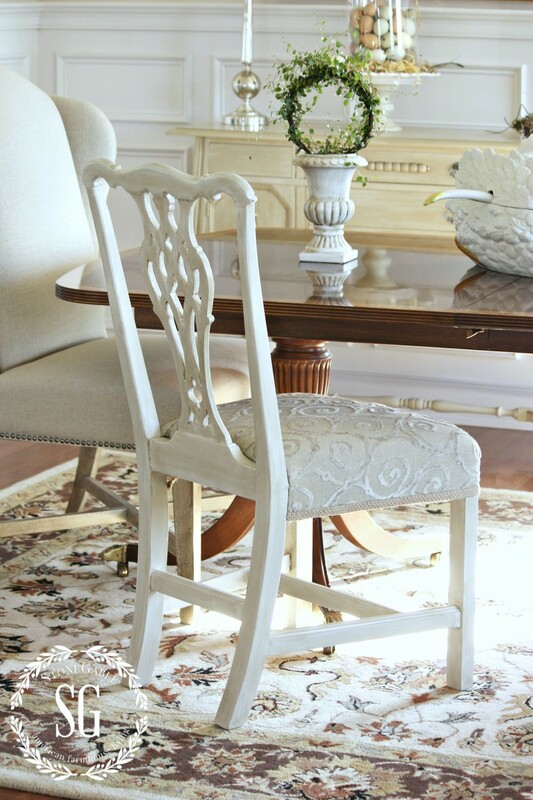 We then broke up the 18th century Ethan Allen dining room set and I painted the chairs and reupholstered them. I had never done a project that large before. If I only knew then what a snowball effect those chairs would cause! It as while I was painting the chairs that I found a really beautiful old sideboard and painted it too. It almost broke my heart to replace it earlier this year but my look had changed! 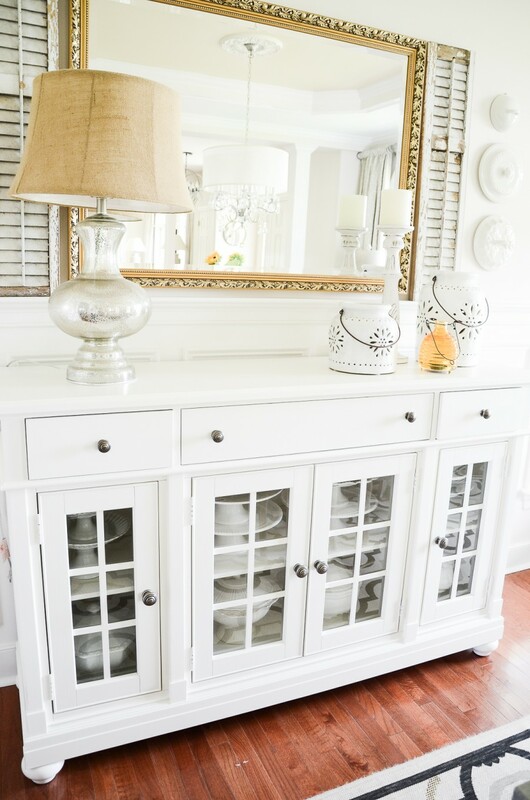 This sideboard is one of my fondest pieces. But like a love you have outgrown you just have to know when to let go! I eventually replaced two of the chairs with a bench… and eventually painted the wooden legs… and upholstered it… and eventually slipcovered it with a drop cloth. Bla, bla, bla, change, change and MORE change… Things came and went and came and went. I got a bar cart for the corner of my dining room. It was a cheapie from Target. I refinished the top and it worked for a few years until I replaced it with a very chic little number from Joss And Main. 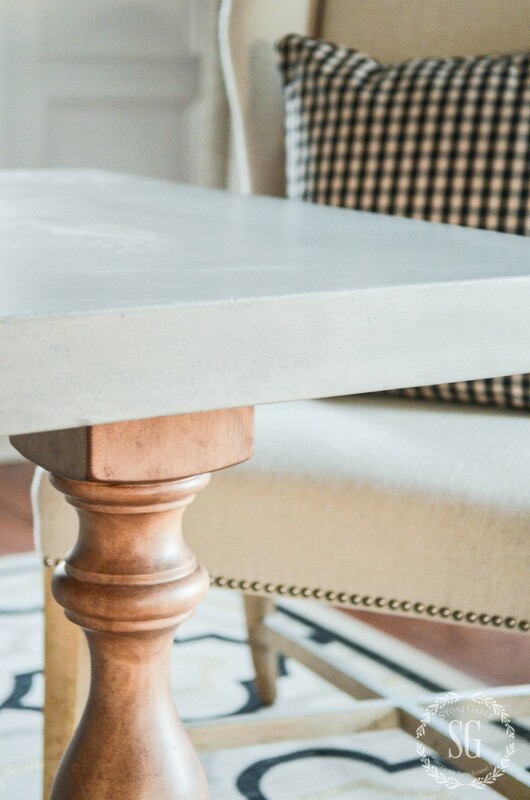 The really big change in the dining room came when I got up the nerve to purchase a concrete topped dining room table. I fretted and debated and went back and forth on this one. It came from Joss And Main and I really did not see it in real life, but I fell quite in love with it. So I eventually had it delivered to me when I could resist it no longer! It was either going to be a world class decorating disaster or a brilliant move. Thank goodness the second! This decidedly took my dining room in a certain direction. No more uber layering, no more clutter! Nice clean lines! They are updated yet have some formality that I love. I don’t have a source for them because they are out of stock right now. Sorry. And this year I replaced my beloved sideboard with a white, glass front buffet. It looks right at home in my dining room. Someone once sang, “It’s a long and winding road…” and so it was and is when it comes to decorating. Am I done? Yes and no! Done for now but not done for good. I’m still mulling over the drapes. I’d love to change them out but I made them and they were a bear to make. And I will have to find material that works for both the dining room and living room as they are both seen from the front of my home. 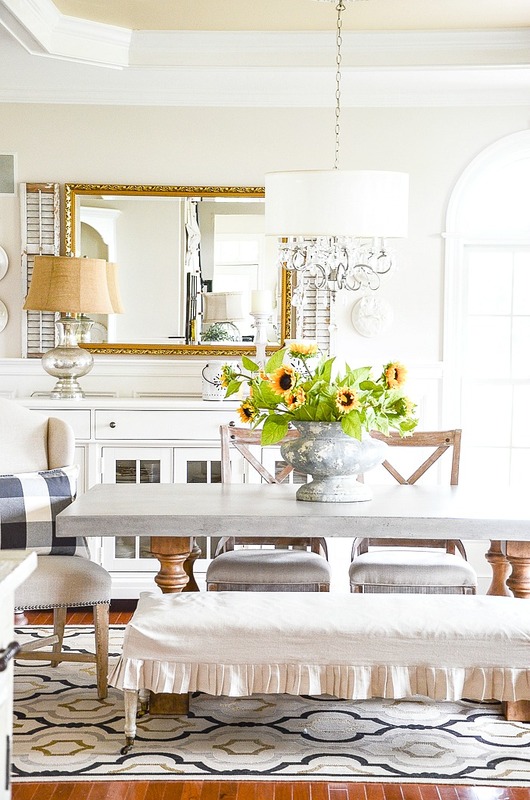 Can you find the one piece that was original to the dining room? See if you can figure it out! 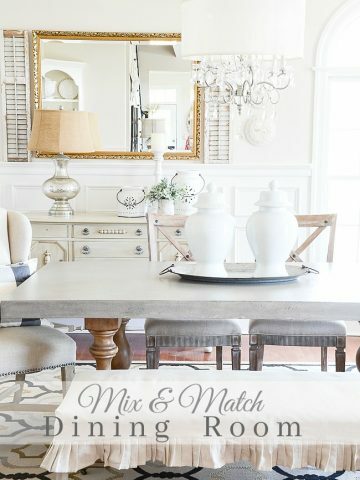 IF YOU HAVE A DINING ROOM READ THIS! The mirror has reflected the light in your dining room and so far has stood the test of time. I realize I’ve followed you a long time as I remember most of these changes!! It is always hard to sew drapes that long. I can see why you hesitate!!! My drapes are a stock size so I’m able to change them every six years or so. It seems to fulfill a need for updating my look. I can see when you put everything out in order how the changes were necessary in the room. The buffet you have now seems to really go with a cement top table!! I still love your rug. You were the first person to put Black into a neutral space and now it’s all the rage!! You were the trendsetter!! Change and evolve. I think that’s great advice. Gwen, you are a treasure! The beautiful mirror is the tried & true common element. My favorite is your white punched ceramic lanterns. I know they move around from time to time. I keep watching for a good sale on them so I too can have a set to play with. Love your style! The mirror is the original piece! Beautiful walk through your changes. Thank you for the ride! 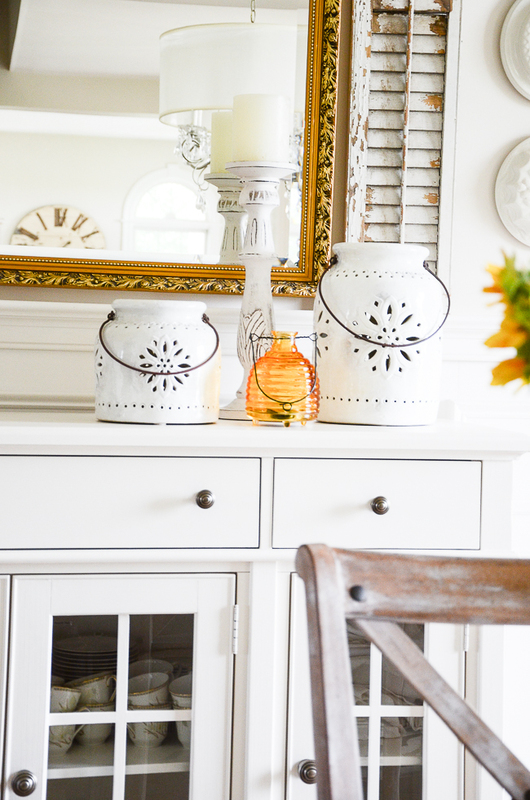 I know how you feel about changing out your sideboard – we just completed a redo of our dining area. We had our beloved 35 year old trestle farmer’s table refinished professionally. We couldn’t part with it for anything, and the quality is superior to most tables available today. The tough part was eliminating our S-Bent rush seat ladder back chairs. We instead updated the look with slipcovered Parson’s chairs from Ballard Design. We love them. The ladder back chairs are now sitting in our basement. I can’t part with them just yet. I am considering painting them but, like another reader said the energy just isn’t there and I hesitate tackling the job. I’m not sure if I could sell them, so there they sit. Also, I am now researching changing out our expensive, but dated, brass chandelier. 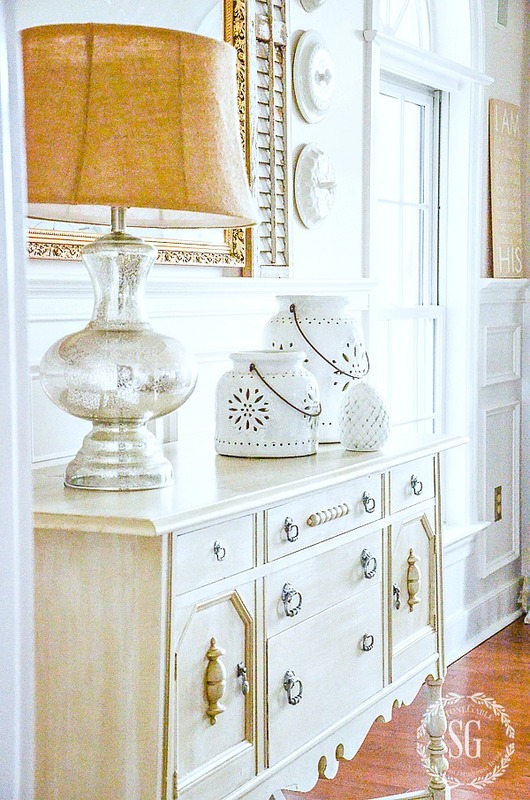 I don’t want to spend a lot as we are changing out all the lighting in the house – looking for something that is a mix of transitional, classic, and farm style. I would love some advice. As I read this post, I kept following the links to your previous postings. And that is how I came across your post about your experience removing the upholstery from your mahogany Ethan Allen Chippendale chairs. I can’t begin to tell you how much I needed to read that post. I am working with a designer to design our retirement home, which will be built in another state. I am simultaneously rebuilding my wardrobe, because I lost weight and my old clothes don’t fit any more. I am anticipating selling the house we have lived in for over 20 years – need to edit my stuff and eliminate what I shouldn’t bring when we move. Plus I am trying to accompany my husband on as many of his business trips as I can, because he gets to stay in luxury hotels and that will go away when he retires. Did I mention I am also a racecar track photographer in my “free” time? Anyway, we recently found this buffet that would make a perfect vanity in one of the bathrooms in the retirement house. When we brought it home, we realized that it has a musty smell. I researched online and found some good advice about what I need to do to clean the piece and get rid of the smell, but it is a project that is going to take extra time when extra time is a rare commodity. I started feeling stressed about that buffet – and then I read your post about removing the upholstery. It helped me to put things in perspective – working on the buffet will take some time, but it won’t be as labor-intensive as removing all those layers and layers of staples!! And you still had all those other chairs to tackle! You’ve kept the mirror! Pretty room, Yvonne. So glad it’s YOU. ? U like the new look, less clutter your eye now knows where to go. Love it ! Evolution — the name of the game when making a house a home! You do it well! The mirror? I always liked the shutters too. 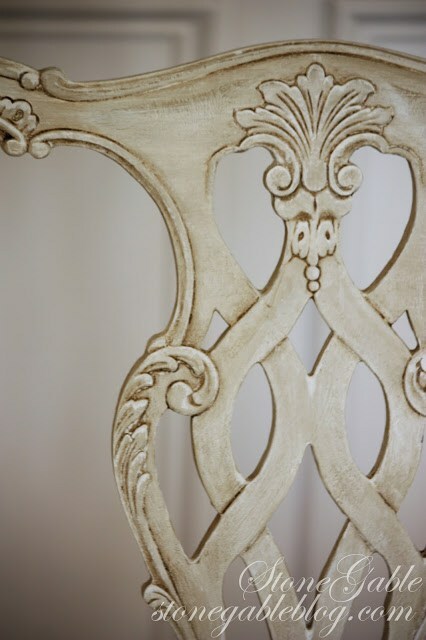 The first time I caught your blog was the one where you painted the dining room chairs. I was thinking about doing that to mine, however, I can’t get up the energy or nerve! Ever since that post, I have been a huge fan of StoneGable blog. 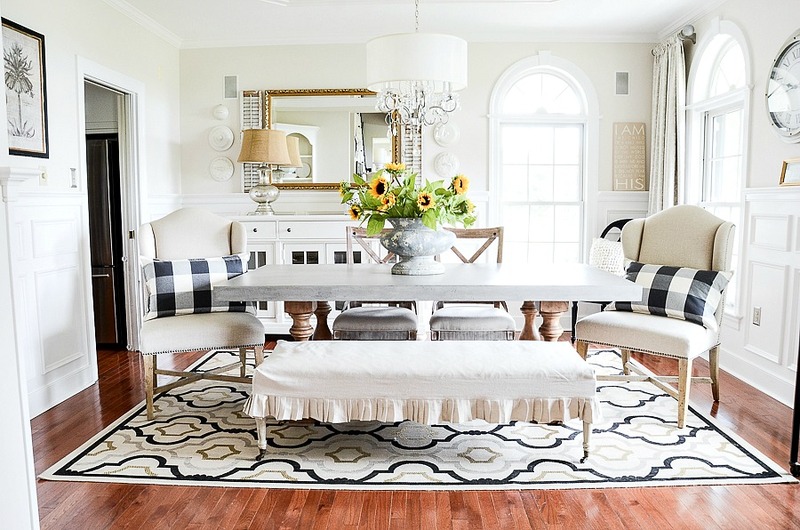 It looks to me like you are moving from a more formal decor to an English-country look and I love it. The sideboard was lovely and gave some old world feel but the new buffet is nice and classy. I enjoy reading the comments and I get some good ideas from these talented fans of yours. 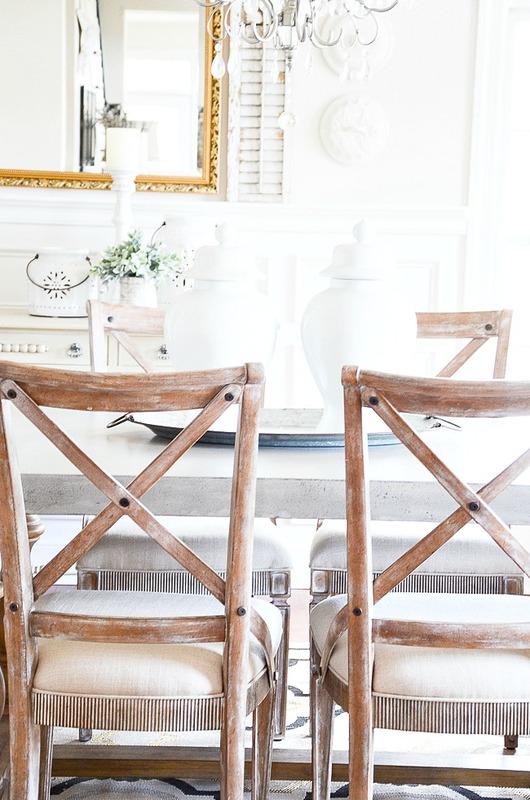 Now, the fabric on the old dining chairs and bench has always been a favorite of mine and I would love to know the name of it or where you bought it. I know it’s been quite a ride going through the transition, but I have loved every minute of watching it come together. Warm regards and happy Fall! First, I think it’s the mirror that has remained! But no matter what it is, it’s all beautiful!!! This is my favorite post out of the many I’ve enjoyed since I found your blog. I love how you’ve put this room together and how the room has changed as you’ve found things that fit your home. It’s gorgeous! Thank you for sharing! The mirror made it through the decorating stage. My guess is the clock!! The room looks great~ in any and all the different ways! Love, love, love the chairs! To each his/her own. I loved the original antique sideboard and upholstered chairs. Classic. But variety is the spice of life, some wise person said. Have enjoyed the evolution or “curation” of your DR. It is simply a lovely, light filled space. I really have liked every phase, along with all of the beautiful furnishings, especially the oriental rug. The newest look is serene and inviting, as well as uncluttered. 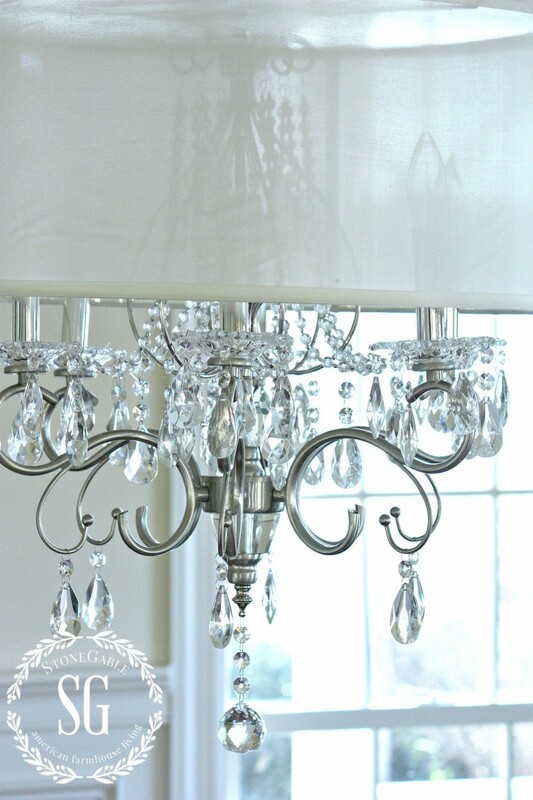 The architectural details and chandelier allow it to remain somewhat elegant. The mirror remains. The DR reflects many of my favorite design elements, since following you. Everything has come together quite nicely.Love the chairs and rug.Are we ever really done with decorating our home,I feel it is always a work in progress ! So happy to see the table uncluttered. That concrete top is amazing and should be seen. The new sideboard fits to a “T” in the room. However, the bench is looking tired…. sorry. 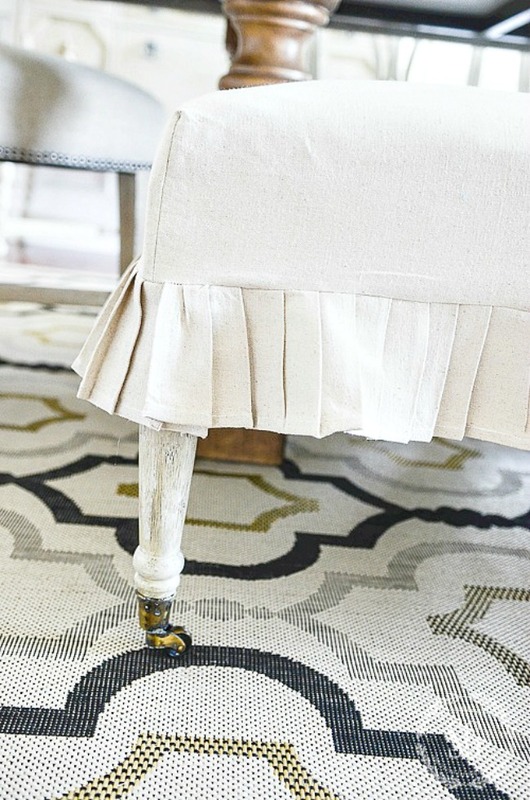 I have added this to my faves because there is so much going on – I am literally studying every nuance of your room – amazing what each and every new detail/change adds! Good morning Yvonne. I believe the mirror has remained. But how beautiful -you have an amazing gift of just putting things together I would never think of doing!! I absolutely loved your previous sideboard-my preference but see why you chose the glass front one. Much cleaner lines. If you could include that old sideboard in your credits when you post the others I would love it. And I love the pillows and we’ll just everything. Especially the drapes. And you made them!! Love all you do Yvonne. Keep decorating. The chair in the corner remains! So interesting as we moved into our house in 2010 too. It was new when we bought it, but like you my style is changing so we’re doing a lot of updates. I was feeling guilty about some of it but you’ve given me courage to plunge ahead! It is the mirror. I like all the changes..the most visual is the hardwood floors..just being beautiful among all the changes.? 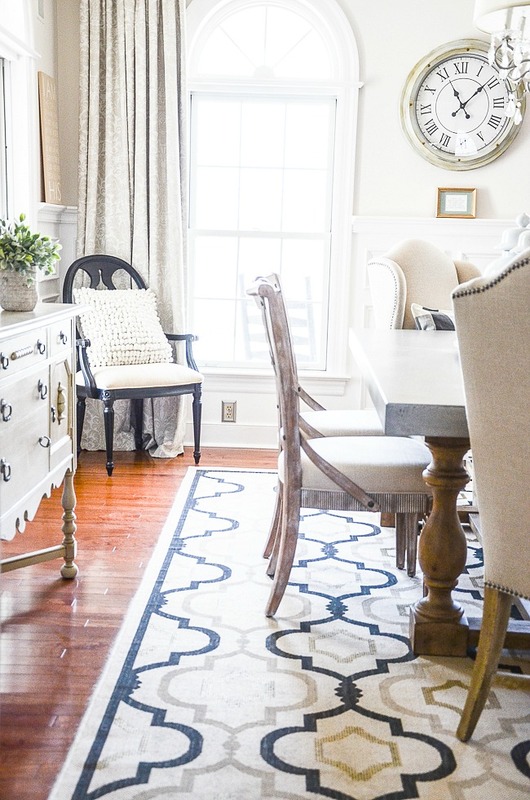 I have loved every step of your dining room transformation. Just keeps getting better and better! Glad you kept one nod to the original – the mirror?! Really curious about your vision for new curtains now! Any hints? ? The mirror seems to be the same….for now! 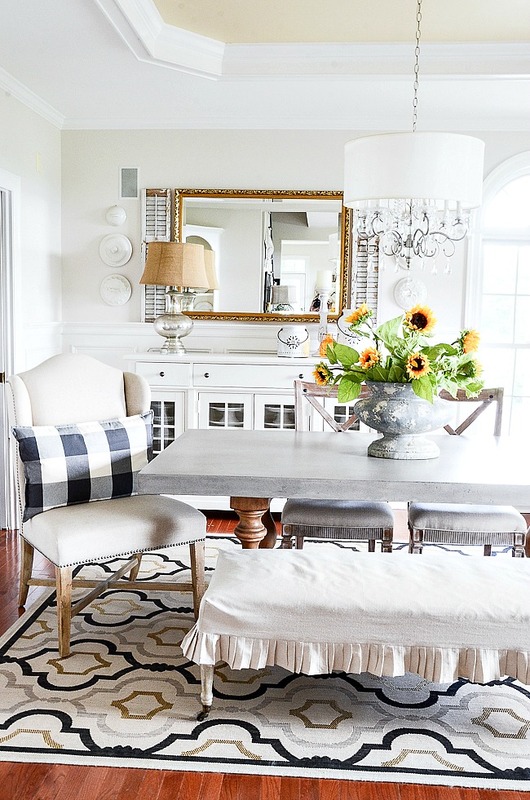 What did you do with that gorgeous, gorgeous original dining room table? 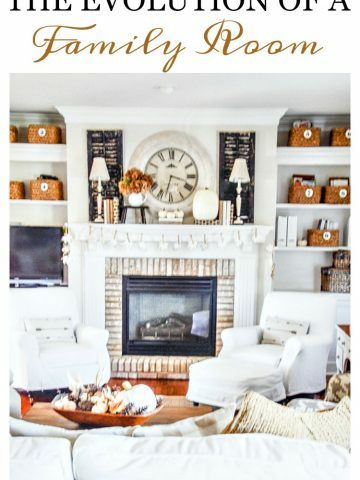 What a fun decorating story! Yes! We have ALL had the “What was I thinking?” moments. My bet is that the mirror is the remaining original item in the dining room. BTW, I liked several of your “looks” for this room. 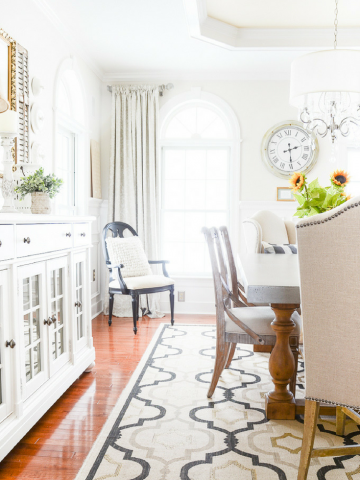 No matter how many changes you make to this room, it has always been one of my favorite dining rooms! I love the new look and I loved seeing the changes over the years! Enjoy the rest of your week! I really love the casual elegance that you have created in this room, Yvonne. I was delighted to read that you painted your old Ethan Allen chairs. I have been wanting to paint a couple of chests from EA that my parents bought me when I was still living at home. I haven’t been able to bring myself to do it, because the (old, boring) maple finish is still good and it’s not junky furniture. Perhaps I will take the plunge now that I see you have done that. Thanks for reaffirming that it’s ok to make mistaked, change your mind and, totally confuse our husbands. Every room in my house is a work in progress. LOVE it. The shutters flanking the mirrors really make that wall. It just didn’t look quite right before. Glad to hear you are still happy with your Ballard indoor/outdoor rug. 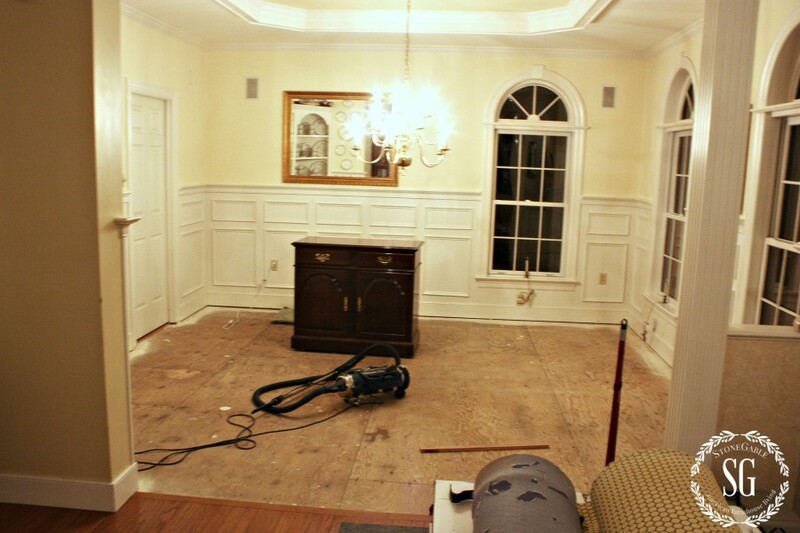 We out down new floors last winter and I put a large one in my family room. I have been so happy with it, I just bought two more…. yes truly perfect, I want to touch and run my hand over your table, love the clock , What is the sketch of? black chair and mirror remain, my favorite frames are gold n black together.